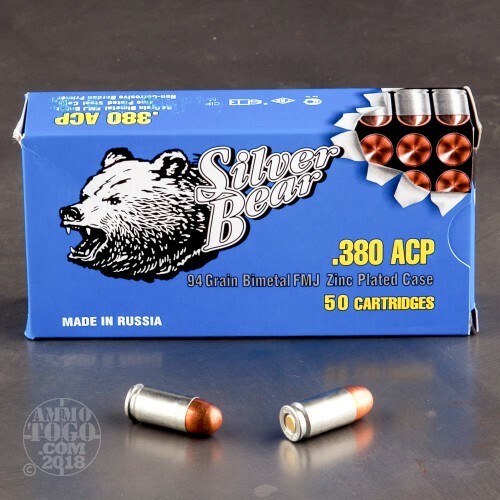 Silver Bear is made at the Barnaul Machine Plant, Russia’s leading producer of ammunition. Located in Barnaul, this ammunition manufacturer is best known for supplying ammo for the Russian army during both world wars. 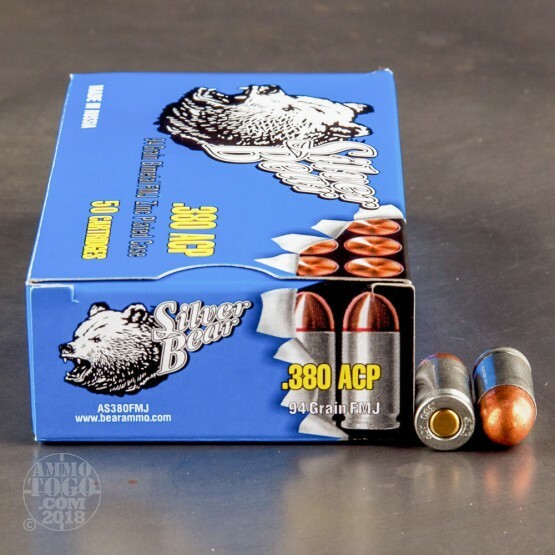 Featuring polished zinc-plated steel cases, (which give Silver Bear ammunition its name), these affordable loads provide reliable functionality in a variety of modern and traditional firearms. Each new production round is loaded with a 94 grain full metal jacket (FMJ) projectile designed for maximum penetration. 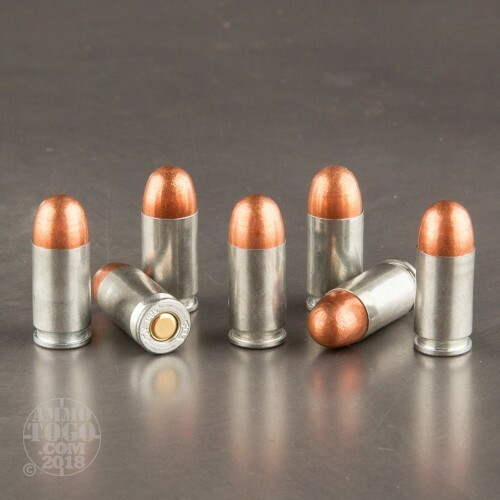 An excellent option for range training and tactical exercises, these precision manufactured rounds are economically priced for high-volume shooting. 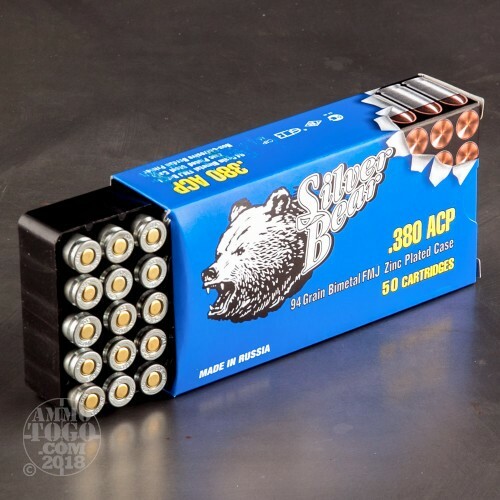 Each of these 50 .380 Auto (ACP) cartridges produces a consistent muzzle velocity of 1000 feet per second and a muzzle energy of 206 foot pounds. These rounds are non-corrosive, Berdan primed, and non-reloadable. They are specially designed for a longer shelf life than most conventional loads, making them a smart choice for long-term storage. I've run this ammo as well as many others. I've had a few FTFs with this and in .45, as well, so I just run a heavier striker spring rate. With higher $ ammo I use a medium or light spring, a standard spring in my Glock when I use this as the primers tend to be a little tougher. PMC can have the same issue at times. So if you have FTFs with certain ammo, don't condemn the ammo until you try a different spring rate. A simple, $10 fix can save you a lot of $$ at the range. Too many people are ready (and actually look forward to) talking down an ammo rather than look for a fix. If you don't know what rate spring your running, look into it. Could save you a lot of swearing, and some money, in the future. Cheap ammo for the range. Never misfired for me. Gets the gun pretty dirty, but I like cleaning my gun so not that big of a deal. Will and have bought ammo again, and again. Silver bear ammo misses fired in my bersa .380 1 out of every 10 shots, I will try truammo next.